Travelling around Bangkok by public bus is pretty easy and cheap. Sometimes for a small dose of adventure we will just hop on a random bus and see where it goes, and generally it’s been a pretty fun way of exploring Bangkok. We’ve stumbled across new markets, seen areas we wouldn’t have otherwise gone to, figured out quicker ways of getting across the city and so on. 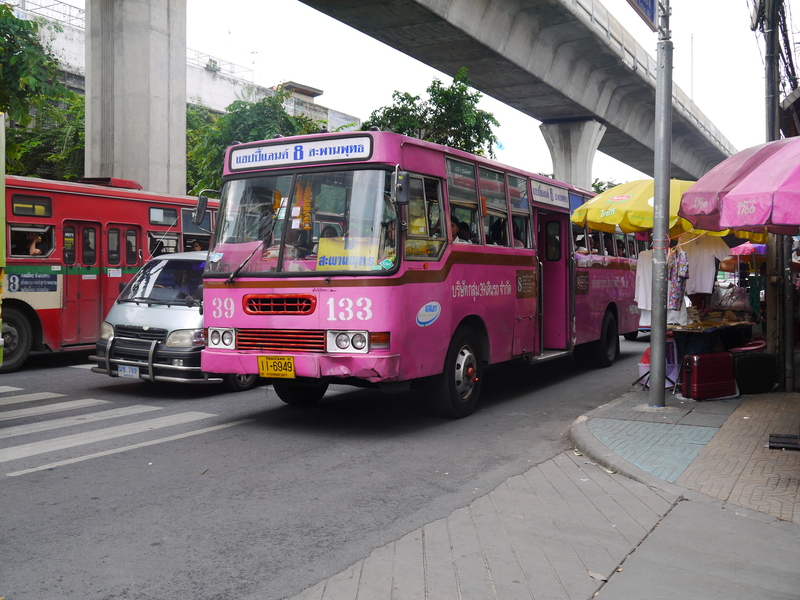 One of the many buses that fill Bangkok’s streets! But travelling by bus is not for everyone and we rarely see other foreigners riding the bus. Some people don’t like to ride because they don’t know how much it costs, where the bus will go or how to make yourself understood. 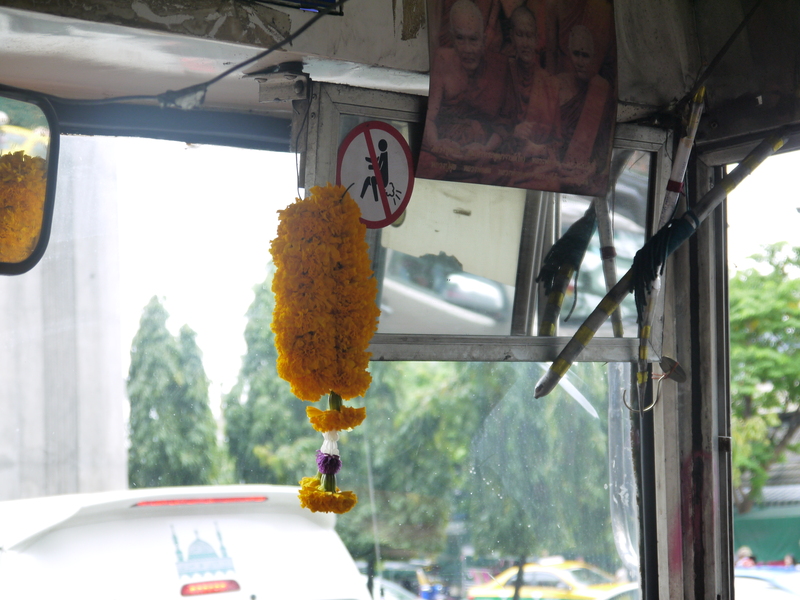 But the biggest challenge of exploring Bangkok by city bus is the fumes, pollution and traffic. Fumes and pollution aren’t so much an issue in Air-conditioned buses but definitely on the fan only buses and non-fan/non-air-con buses (Or ordinary bus). Given this issue I was surprised to see this sign below in a fan bus the other weekend. No farting sign on an open windowed fan bus. If you’ve ever walked along the streets in Bangkok, you’ll know that you often smell some not so pleasant things from garbage to canal water, mix that with car fumes and it can be pretty smelly. So I’m assuming that the no farting rule on this bus must be to make sure things don’t smell worse. I do wonder how you’d be able to tell though where the smell was coming from – especially with all the windows open! Having said that, I still find the buses a fun and enjoyable way of exploring. If we know we are going a long way we’ll opt for air-conditioned bus but if it’s just a short 15 min trip any bus will do. Although if you decide to wait for a particular bus you could be waiting awhile, the schedule seems a bit haphazard especially with Bangkok traffic. So if you are going a long way or need to be somewhere quick maybe choose a different mode of transport. But once you understand a few simple things bus travel it is pretty easy. 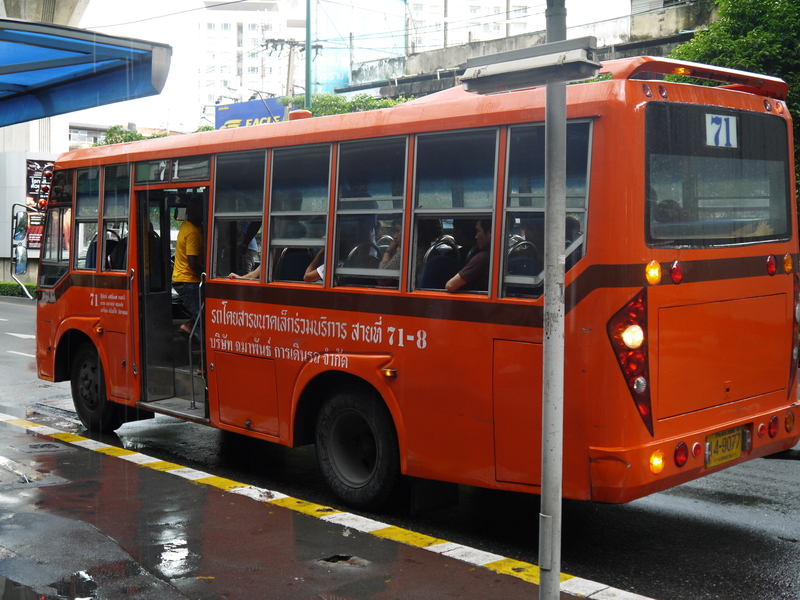 There are three types of city buses in Bangkok – Ordinary, Fan, or Air-conditioned. And unless you’ve lived in isolation all your life it’s pretty easy to figure out which is which. Both the fan buses and the ordinary buses have set rates and it doesn’t matter how far you go, it will be the same price. For an ordinary bus the flat rate is 6.5 Baht, and fan buses are 8 Baht. If you are lucky you might get to catch one for the free buses, which is one of the ordinary buses with a blue sticker with Thai writing all along the bottom of the wind screen and the back window of the bus. The tricky part comes if you want to ride an air-con bus because you need to know how far you are going, as the rates change depending on where you get off. But generally it is between 11 and 20 Baht. Just tell the conductor where you want to go when they come to collect your money. The easiest option to find routes or bus stop is to use google maps on your smart phone. It’s not perfect in terms of where the bus stops are but generally gives a good idea of approximately where it will be, sometimes there will be extra stops not on the map. If you don’t have a smart phone you can buy a bus map of the city from local bookstores (eg. Asia books) but it can take a lot of time and energy to figure out. Whereas pressing on a bus stop indicated on google maps will tell you which buses go past there – or asking google maps for directions using public transport will give you some suggestions. « Food Friday – Yam Kai Dao – a delicious Thai salad!